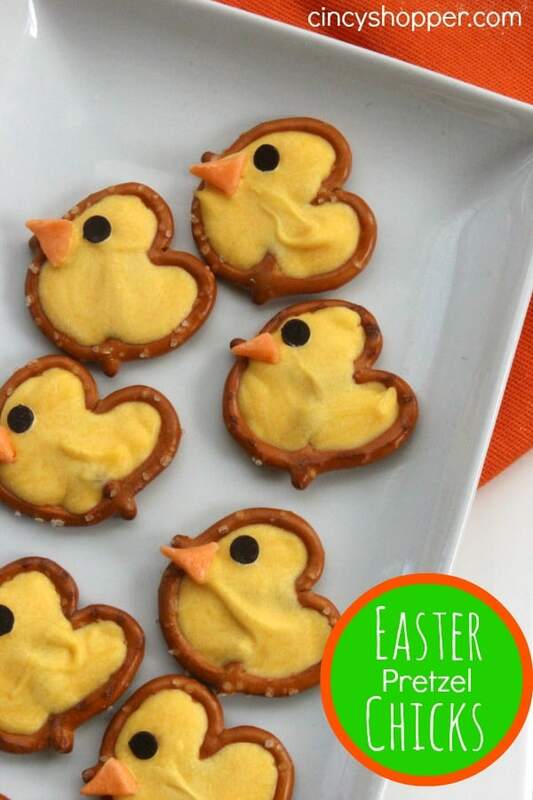 These Easter Pretzel Chick Treats are such an easy treat to whip up for Easter. My kiddos have a three day weekend this week. We took some time to make some treats to enjoy. Since the older four are teenagers, they can really polish off some serious food, ha ha. 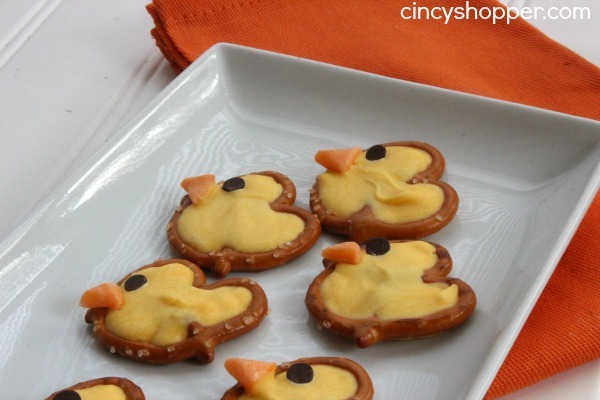 They all love pretzels and chocolate so these Easter Chick Pretzels were perfect to have for snacking. I placed some in snack bags for next weeks lunches when they were not looking, lol. Hopefully the hubby and kids do not find my stash before they head back to school on Tuesday. I always pick up numerous bags of pretzels while shopping at Aldi. They are a cheap and somewhat healthy snack for all of us to munch on. I just added in some yellow chocolate and some orange Starbursts for the chick beaks. So simple yet so cute. Pipe candy over inside of pretzel to form shape of chick. Smooth with finger if necessary. These Easter Pretzel Chick treats would be great to toss into a dish for your Easter Table dessert table too! They are so adorable and so tasty. If you are looking for other great Easter Ideas be sure to check out the Easter/Spring Cake Cookies, PEEPS Cupcakes, Sheep Cupcakes, Homemade Butterfinger Eggs, PEEPS S’Mores, Easter Chick Deviled Eggs, Nutter Butter Chicks, Reese’s Peanut Butter Eggs Coconut Cream Eggs, Coconut Birds Nests Cupcakes, Easter Egg Cake Bites and the Chocolate Covered Peeps that I have shared this past week. I will be sharing some great recipes and DIY Crafts for all of your Easter Holiday needs in the next few weeks. love these!!! so cute yet simple. Pinned ya! Please come share at the Anything Goes linky party, if you have not already. I love these treats. How cute are these? I love it! Thanks for the great ideas! OMGosh adorable! I’d be pleased if you could visit my blog and perhaps share some of your DIY’s in my new linky party, Support Your Fellow Crafter on Monday’s? Thank you so much! 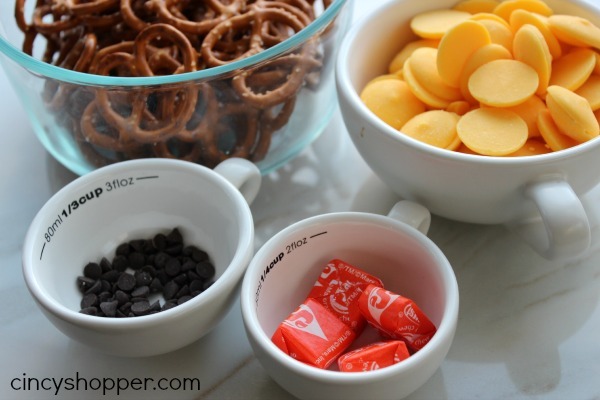 my kids will love making these, thanks for sharing! Fun idea! I’ve never seen it done before : ) Looks super easy too. These are such a great idea, yummy and adorable! Thank you for sharing your post on our Share Your Style Party. 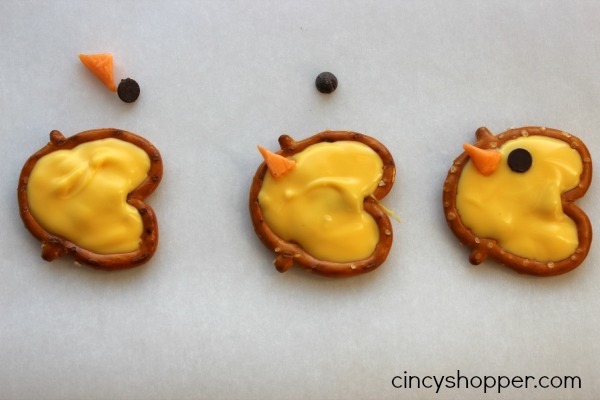 These little pretzel chicks are so clever and cute!